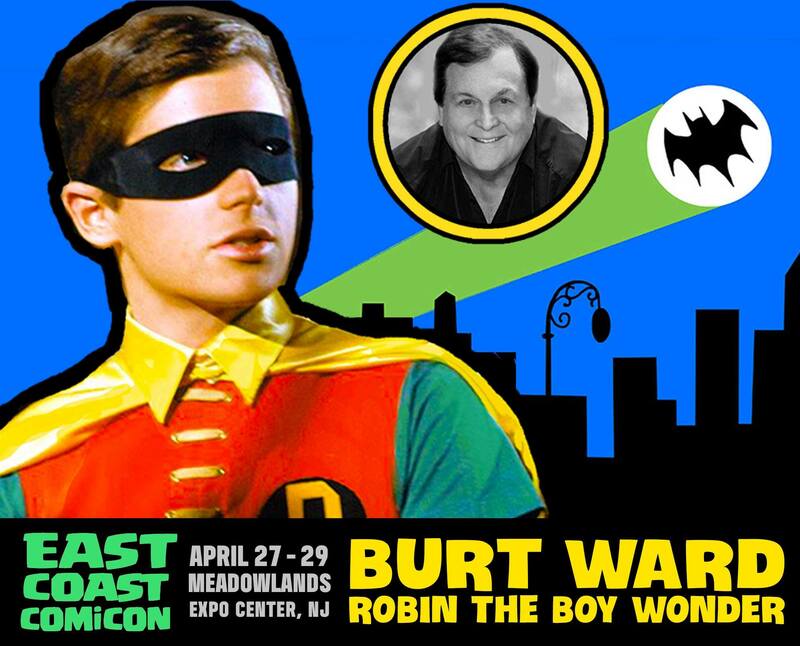 Burt Ward, the once and present Robin the Boy Wonder, will be a headliner at buddy Cliff Galbraith’s East Coast Comicon in April. Ward, as if I have to tell you, was the greatest of all Graysons and has reprised his role in the recent animated films Return of the Caped Crusaders and Batman vs. Two-Face. Anyway, we’re proud sponsors of East Coast Comicon, so I’m especially looking forward to chatting with Ward at the show, which is now three days (April 27, 28 and 29) at the Meadowlands Exposition Center in Secaucus, N.J. It’s a short Batmobile ride from the real Gotham City — New York. In addition to Ward, the show is shaping up to be another really good one from Cliff and co. Comics guests already announced include Roy Thomas, Howard Chaykin and Kyle Baker. You can also consider this an official 13th Dimension Holiday Hot Pick! Tickets make great gifts and they’re on sale now: Click here for details. — Why BURT WARD is the Greatest of ALL Robins. Click here. Would love to get there Burt!! firstly, i’m going and i’m sooooo excited!!!! secondly, is he going to have his own photos there, or do i have to bring a photo? thirdly, do you have to get the tickets to see him online or could i get them at the door? i have the tickets to the event already, but my dad said he didn’t see any tickets for the guests. Sadly, my understanding is that Burt Ward has cancelled his appearance.